Based on range, the less than 500 km segment is projected to lead the electric aircraft market during the forecast period Based on the range, the less than 500 km segment is expected to lead the electric aircraft market during the forecast period. 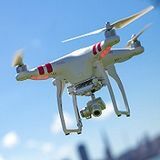 Aircraft can achieve higher range with the introduction of advanced and high capacity batteries in the market. As a result, the electric aircraft with increased range were launched for commercial use. The ultralight electric aircraft available in the market mostly have range from 0 to 500 km. These aircraft are used for recreational and training purposes. 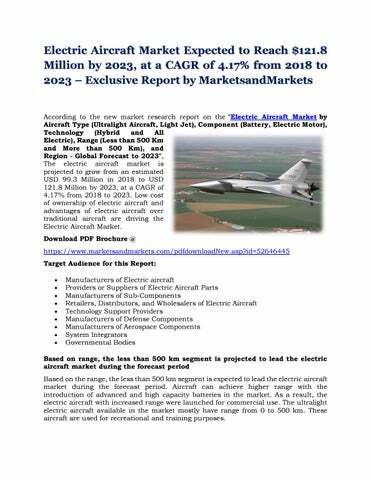 Based on component, the battery segment of the electric aircraft market is projected to witness the highest growth during the forecast period Based on component, the battery segment of the electric aircraft market is projected to witness the highest growth during the forecast period. Batteries and other storage devices can be installed in the primary structure of the electric aircraft; most electric powered aircraft use lithium-ion batteries. These batteries are economic and can be scaled to build larger systems of several hundred kWh energys capacity. The Europe region is expected to lead the electric aircraft market during the forecast period from 2018 to 2023 The Europe region is expected to lead the electric aircraft market during the forecast period. The aircraft industry in Europe is aiming to use new advanced materials, such as gamma-titanium aluminides and single crystals, with improved mechanical properties, these advanced engines help aircraft reduce its fuel consumption, carbon emissions, and noise pollution. Ask for Sample Report @ https://www.marketsandmarkets.com/requestsampleNew.asp?id=52646445 Key Market Players Major players in the electric aircraft market include Zunum Aero (US), Yuneec International (China), PC Aero (Germany), Pipistrel (Italy), Eviation Aircraft (Israel) Lilium (Germany), Schempp-Hirth (Germany), Volta-Volaré (US), Bye Aerospace (US) and Electric Aircraft Corporation (US) among others. Don’t miss out on business opportunities in Electric Aircraft Market. Speak to our analyst and gain crucial industry insights that will help your business grow. About MarketsandMarkets™ MarketsandMarkets™ provides quantified B2B research on 30,000 high growth niche opportunities/threats which will impact 70% to 80% of worldwide companies’ revenues. Currently servicing 5000 customers worldwide including 80% of global Fortune 1000 companies as clients. Almost 75,000 top officers across eight industries worldwide approach MarketsandMarkets™ for their pain points around revenues decisions. Our 850 fulltime analyst and SMEs at MarketsandMarkets™ are tracking global high growth markets following the "Growth Engagement Model – GEM". The GEM aims at proactive collaboration with the clients to identify new opportunities, identify most important customers, write "Attack, avoid and defend" strategies, identify sources of incremental revenues for both the company and its competitors. MarketsandMarkets™ now coming up with 1,500 Micro Quadrants (Positioning top players across leaders, emerging companies, innovators, strategic players) annually in high growth emerging segments. MarketsandMarkets™ is determined to benefit more than 10,000 companies this year for their revenue planning and help them take their innovations/disruptions early to the market by providing them research ahead of the curve.